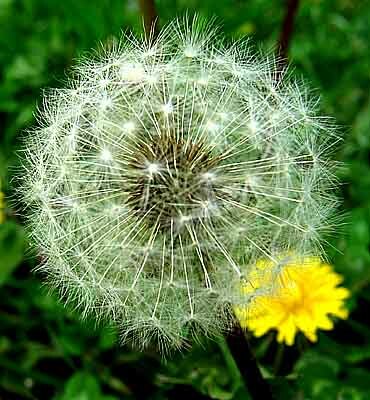 Dandelion (Taraxacum) is a large genus of flowering plants in the family Asteraceae. They are native to Eurasia and North America. Dandelions are a perennial plant that grows best in full sun with moist soil. Once the plant is established, though, it can handle shade and water deprivation. The plant bears bright yellow, round flowers, and leaves that have a tooth-like shape. The plant's name comes from the French phrase dent de lion, means lion's tooth. 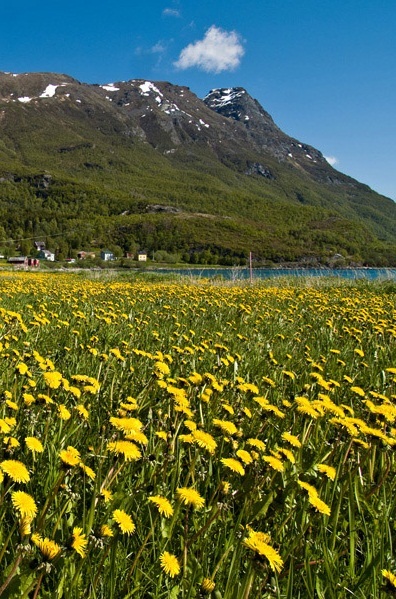 The roots of the dandelion can extend as far as 15 feet into the ground, though they are usually 6 to 18 inches deep. Any broken parts of the plant excrete a milky white substance. The flowers grow all year, without pollination, and once they ripen completely they turn into seeds that can fly away and grow new plants. Dandelions have many culinary uses. All parts of the plant can be eaten, including as part of salads, cooked or sauteed, even fried. 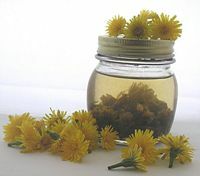 Dried dandelions are used to make tea, and the flowers can be turned into wines. The roasted, ground roots can be used as a caffeine-free dandelion coffee. Dandelion flowers can also be used in decor, and the plant has traditionally been used for medicinal purposes. Dandelions are rich in beta carotene, iron, calcium and vitamin A. They are known as an effective diuretic, and have traditionally been used to help in the treatment of the liver and gallbladder, including aiding in removing gall stones and helping to decrease liver swelling. Dandelion can also help with minor indigestion. The white sap of the plant can also be used to improve skin complexion and to help heal skin blemishes such as blisters. 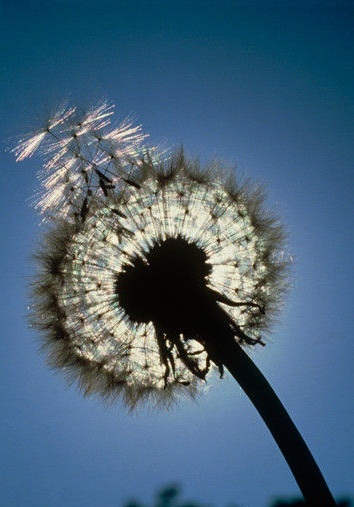 Dandelion seeds are carried away from the plants by the wind, they can fly for miles. After landing, the seeds can sprout right on the soil's surface at any time of year, which allows new plants to grow easily. If the plant is cut off, it can also regrow.